Draping behind Stage – All Round and 8’ tables and chairs – Standard Polyester Linens and napkins for Tables and Head Table – Some restrictions apply. People using the Hall more than 4 hours the day before for setup will be charged a rate of $25 per hour – and is not open to the public! Other wine purchased at the LCBO is available but costs will vary. 1. Any individual, group or organization using Hall facilities assumes full liability for any losses of or damage to Hall property, or neighbouring property, resulting from such use. Each applicant should obtain adequate liability insurance coverage for the use of the Hall facilities to cover any damage or injury occurring during your event. The Goderich Columbus Club and Knights of Columbus shall not be responsible for any claims for damages or held liable for any charges which may be made as a result of the use of the facilities by the applicant. 2. The hall is fully licensed and the Knights of Columbus must look after all bar facilities. 3. No tape is allowed on the floor, walls or ceiling. See management for exceptions. 4. No confetti of any kind including plastic hearts, sparkles, etc... is allowed. 5. No open flame candles are allowed unless floated in water or protective covering. 6. Bar closes at 1 a.m. and the Hall should be cleared no later than 1:30 a.m.
7. The Knights of Columbus arranges for and will provide approved caterers. A separate deposit can be requested by the caterer. This amount will be deducted from your final Hall billing. ** Please note that no one other than the licensed caterer and his staff are allowed access to or use of our kitchen facilities due to Health & Safety Regulations. 8. Knights of Columbus will set-up tables and chairs as close to your request as possible. Client is responsible for setting out linens, place settings, decorating and Band or D.J. 9. Linens included in the group packages are set out and cleaned up by the client, and must be placed in bags provided at end of function by lessee. All shortages and damaged items will be billed to the Lessee. If not on a group package linens are the responsibility of the client. at 10am –pending availability or other arrangements made with the office. 11. The Knights of Columbus or Goderich Columbus Center is not responsible for anything brought in or left by people in the hall or coatroom areas-please remove all gifts or valuables. Please secure your vehicles as well and do not leave valuables in your car! 12. Final confirmed number of guests for meals and linen orders will be due two weeks prior to the date of the event. Linens and rental items not provided for in the group package is the responsibility of the Lessee. 13. All deposits to the Hall (or deposits requested by the caterer) are due at time of booking and are not refundable. 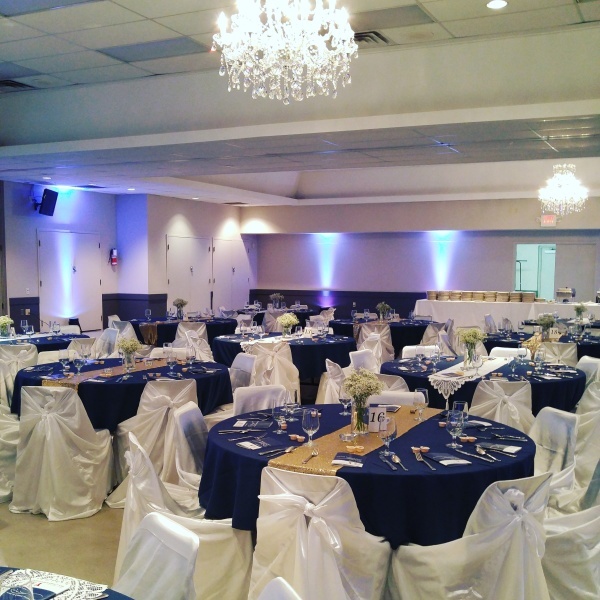 If a function requires a date change in advance for legitimate reasons, and the Hall is available on that date, we will do our best to accommodate that change. Further deposits are required closer to the time – final costs of packages due the day before on the Friday to the Hall by 1pm at the latest by cheque – all bar charges to be paid at time of function close on that evening – no exceptions. 14. Please note that rental of the 2/3, 1/3 or Full Hall does not include the separate Lounge/Meeting Room or access to the kitchens. Can be rented for $125 per day. 15. Customers must provide supervision of young children. As a licensed Hall we have many fire exits that cannot be locked and automatic doors. Children are not to be in the kitchens at any times and should not be playing with carts, wheelchairs or unsupervised. 16. Customers on package with less than 120 adult meals in 2019 will experience a further charge of $2 per person to compensate for Full Hall useage with smaller numbers – in this case the Hall will not rent out the 1/3; even if it is not required; to a second group! **Rates are available upon request for 2020 year. for the same price to each of our clients. * Due to cancellations in the past the caterers are allowed to ask for deposits at time of booking – these amounts will be removed from your final billing if you are on a “package” deal. Licensed caterers use Hall facilities, equipment, prepare meals at the Hall for each function and are fully certified.